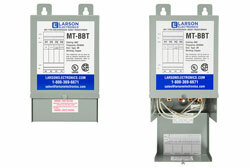 The MT-BBT-208V-229V-3P-31.25A three phase step-up Buck and Boost Transformer from Larson Electronics is powerful, reliable, and designed with the environment in mind. This transformer is designed to increase 208 volts to 229 volts, and is needed when the line-voltage is lower than the required voltage for equipment. Suitable for both indoor and outdoor applications, the MT-BBT-208V-229V-3P-31.25A provides increased reliability, higher efficiency, protection against critical equipment failures and an extra level of protection by isolating the power source from the connected device. The lower operating costs, lower heat emissions and lower cost of ownership make this transformer ideal for a wide range of applications and businesses. Transformer Features: The MT-BBT-208V-229V-3P-31.25A buck and boost transformer is a three phase unit with a 12.39 kVA rating and a primary voltage of 208V AC using a maximum of 34.41 amps on the primary side. This step-up transformer has a secondary voltage of 229 V and provides up to 31.25 amps on the secondary side. Featuring robust construction, this unit`s cores are manufactured with non-aging, cold-rolled silicon steel laminations using state of the art technology. The MT-BBT-208V-229V-3P-31.25A is designed to increase voltage from an input voltage of 208 volts to an output voltage of 229 volts. The increase of voltage is necessary when the on-site line-voltage is consistently lower than the voltage required by the equipment being operated or installed, preserving the lifespan of the equipment and guarantees correct operation without risking damage due to incorrect voltage. This step-up transformer will allow equipment that draws up to 31.25 amps at 229 V to be powered from 208 V power sources. Situations for this type of transformer may include lower voltage from your electrical provider or within the existing establishment, or operating equipment that requires a lower voltage than is provided at the existing establishment. This unit boasts a low cost of ownership and is highly energy efficient. Lower heat emissions mean less cooling is needed as well. The NEMA 3R painted steel enclosure makes the unit suitable for both indoor and outdoor applications. This step-up transformer can be either floor or wall mounted. The MT-BBT-208V-229V-3P-31.25A features a 130°C insulation with a 80°C temperature rise. Construction: The aluminum winding in the MT-BBT-208V-229V-3P-31.25A are formed from high quality aluminum wire helps to improve performance. The close tolerances used during manufacturing also eliminate burrs which hinder performance. Each core is specially coated to prevent the ingress of moisture and are electrically balanced to minimize axial forces during short circuit situations. Buck and boost transformers are designed to maximize the performance and life of electrical equipment. The MT-BBT-208V-229V-3P-31.25A is encapsulated in silica sand and resin, and cased in a NEMA 3R steel enclosure. NEMA 4, NEMA 4X, and NEMA 12 enclosures are available upon request. Benefits: The MT-BBT-208V-229V-3P-31.25A buck/boost step-up transformer offers many benefits to the consumer. Buck/boost transformers pass the majority of the load voltage directly through the transformer, only transforming a small percentage of the load. Due to this technology, a smaller and quieter step-up transformer is manufactured and uses less material. This provides owners with significant energy savings as well as offering environmental benefits. Higher efficiency extends the life of the transformer and turn into cost savings for owners in the form of lower energy bills and a decrease cost of ownership when compared to large autotransformers. Installation and maintenance costs are reduced due to the smaller form factor, and less overall space requirements are decreased. In addition, these step-up transformers operate quieter than a standard autotransformer of the same capacity. Installation: Installation is simple. Connect the primary leads and secondary leads to the step-up transformer per the provided wiring diagram. Knockout hubs on both side and the bottom of the transformer allow for easy line-in and line-out wiring. The front access cover provides convenient access to the eight lead wires. The MT-BBT-208V-229V-3P-31.25A is shipped with the necessary wire nuts for wiring this step-up transformer in-line between line voltage and equipment. Applications: Air conditioners, lighting systems, heating elements, motor applications and other applications that require the ability to power loads that differ from the available line voltage. Limitations: While there are many benefits to a buck/boost transformer, there are some limitations to consider. This transformer will only transformer voltage, it will not convert phases, has no circuit isolation, and does not create a neutral for applications where a neutral is not already present. If any of these limitations apply to you, you will need a standard transformer. Please see below link for our standard line of industrial transformers or our line of phase converters.